Denim Bib Shortalls are made of Top Quality Denim. Two Side Hand Pockets On Short Area. One Pocket on Top. Two Pockets at Back. Two Buttons on Each Side. These Dungarees are very Attractive and Stylish. These Dungaress are Trendy and Fashionable with a Pleasing Appeal. Denim Shortalls Dungarees are Made of Top Quality Denim. Adjustable Straps. Strong and Neat Stitching. Two Side Hand Pockets on Short Area, One Pocket on Top & Two Back Pockets. 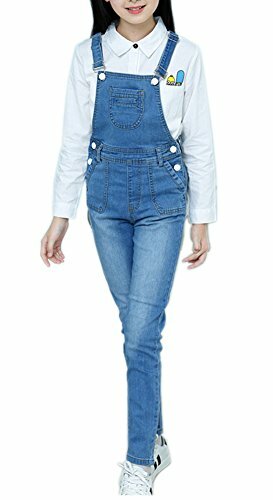 Attractive, Stylish, Fashionable and Trendy Dungarees. 3-4 Years/ Little Kids (Tag Size 110 cm): Pants Length:26".---Waist:19".---Hip:29".---Height:41"
4-5 Years/ Little Kids (Tag Size 120 cm): Pants Length:28".---Waist:23".---Hip:31".---Height:45"
6-7 Years/ Little Kids (Tag Size 130 cm): Pants Length:30".---Waist:25".---Hip:33".---Height:49"
7-8 Years/ Big Kids (Tag Size 140 cm): Pants Length:32".---Waist:26".---Hip:30".---Height:53"
9-10 Years/ Big Kids (Tag Size 150 cm): Pants Length:34".---Waist:28".---Hip:34".---Height:57"
11-12 Years/ Big Kids (Tag Size 160 cm): Pants Length:36".---Waist:29".---Hip:36".---Height:61"
12-13 Years/ Big Kids (Tag Size 170 cm): Pants Length:38".---Waist:31".---Hip:37".---Height:65"
Here at Sitmptol, we're passionate about beautifully designed, stylish and unique clothes that excite and inspire season after season, at brilliant prices. We're 100% focused on delivering fantastic clothes. Our attention to detail, quality materials and high fashion designs has attracted a legion of classy and loyal customers - that's you! We aim to provide our fashion-conscious customers with all the latest fashion trends at the lowest prices, all in one place. Sitmptol has an excellent array of styles, there really is something for everyone and for every occasion. Classic denim overalls featuring tapered legs, adjustable straps, and convenient front bib, 2 side, and 2 back pockets to keep your hands free to do other things. Stylish boyfriend style, match with any casual and formal outfit, soft and breathable fabric. Adjustable shoulder straps with button hook fastening, mock fly, five-pocket construction, a fade wash, front whiskering, mid-waist, pockets on the front and back, relaxed-fit. Great for casual everyday wear, beach, kid photoshoot, play show, fashion show, play wear dress, school, Easter, birthday party and so on. If you have any questions about this product by Sitmptol, contact us by completing and submitting the form below. If you are looking for a specif part number, please include it with your message.